This series of articles titled “Redeemer 101” is designed to help those who call Redeemer Church “home” better understand who we are as a church and why we do what we do the way we do it. Also, it will be a helpful guide for those searching for a new church home to decide whether or not Redeemer is the right church for them. As we begin this series I am going to focus on the Core Values that permeate every aspect of the ministry of Redeemer Church. Our Core Values are: Gospel-Centered, Spirit-Empowered, and Mission-Minded. 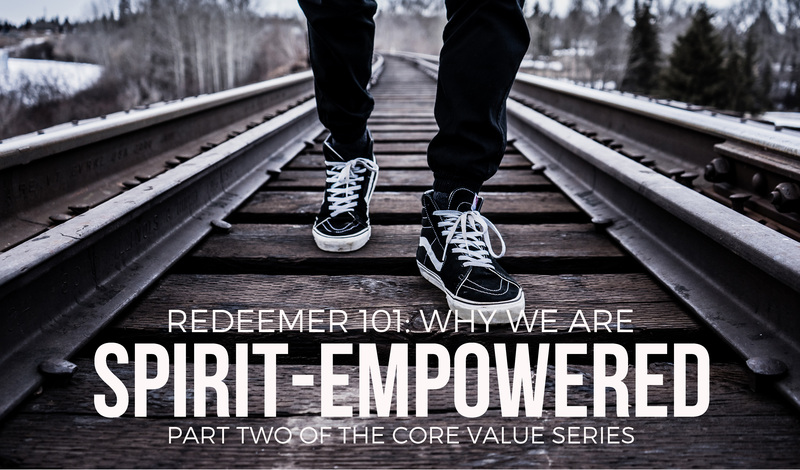 In this article I will briefly describe what we mean by being a “Spirit-Empowered” church. The answer is “Yes”! They were commanded to “Go” and “Stay”. Jesus had commanded them to go around the world as his witnesses making disciples only after they had been given the power necessary to carry out the mission. And where did the power come from….the Holy Spirit. Notice in Acts 1:8, “You will receive power when the Holy Spirit comes on you; and you will be my witnesses.” What was necessary for the disciples to fulfill the command of Jesus was God’s power, and that power only comes through the work of the Holy Spirit in the lives of the followers of Jesus. If we were to continue reading we would discover that the Holy Spirit began permanently filling believers at Pentecost in Acts 2, and has been filling believers ever since. The Apostle Paul tells us that all believers are “temples of the Holy Spirit” (1 Cor. 6:19) because He lives in us! What an amazing truth for Christians to contemplate…God lives in us to empower us! What does this mean for Redeemer Church? There are all kinds of implications for Redeemer Church based on this incredible truth, but I want to focus on just three. 1. Spirit-empowered ministry is Christ-centered. Any church that lifts up Jesus, and makes much of Jesus is guaranteed to have the power of the Holy Spirit at work in its midst because where Jesus is exalted the Spirit is at work. 2. Spirit-empowered ministry is Dependent. Dependent on what? Well, it’s not “what”, but rather “Who”! We are absolutely dependent on the Holy Spirit to accomplish the mission of being Christ’s witnesses and making disciples. That’s why Jesus told his disciples to wait before they went around the world preaching the gospel. It would have been impossible for them to accomplish Jesus’ command without the power of the Holy Spirit working through their effort. The same is true for us. Redeemer Church will not be the church that Jesus desires unless the Holy Spirit is at work in and through the people who call Redeemer their church home. It is impossible for us to do God’s work in our own strength. Which is why Jesus said in John 15:5, “Apart from me; you can do nothing.” Jesus sent the Spirit in order to continue working through his people in the world that he loves so much. Which leads us to our final point…. 3. Spirit-empowered ministry is Effective. By “effective” I mean accomplishing things of eternal significance. This is an important point because we can do lots of things that are not being empowered by the Holy Spirit. There can be all kinds of “evidence” that God is at work that is not really God at work, but rather it’s just the natural result of hard work and using particular techniques. However, if we want to see lives transformed from the inside out…if we want to see the communities of the High Desert changed for the glory of God…well, only the Holy Spirit can do that. That’s what we mean by “effective”. Real transformation, and more people loving and worshipping Jesus. Why? Why do we want to see more people worshipping and living for Jesus? Because it’s the best life anyone could ever experience, and he is worth it! Why would we give our lives to anything else?